Psi Chapter was founded at the University of North Carolina in 1888. Pete Murphy, John and Crawford Bennett, John M. Covington, William Darden, Frank Beall, and George Butler were the first members. During the time of WW I, chapter operations were reduced as many young men committed themselves to serving the nation in a time of war. The first chapter home was located on ''Old Fraternity Row'' built in 1901. Sadly, in 1919 an accidental fire destroyed the Sigma Nu House. Construction on a new house began in 1925 on land known as ''Fraternity Court.'' The house stands at 109 Fraternity Court, facing towards Columbia Street. After World War II, membership in Psi Chapter grew to upwards of 60-75 men. Sigma Nu excelled on campus led by Jim Exum, Ψ 724, and others. 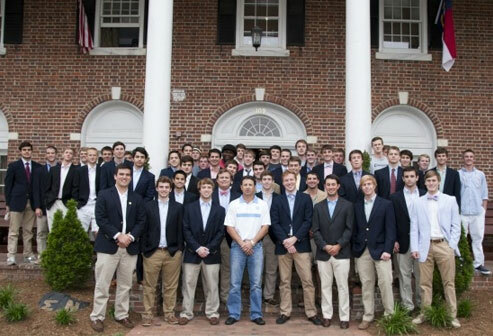 From the 1960s to the 1990s, Sigma Nu prospered at UNC despite the various social upheavals. In 1988, Psi Chapter celebrated its centennial and in 1992 received the Rock Chapter Award---an honor bestowed upon the best-of-the-best chapters in Sigma Nu.